Some beautiful colored balloons float in the air. 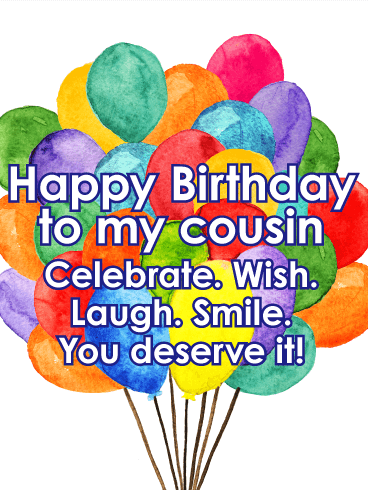 What a wonderful way to celebrate your cousin on their birthday! This charming card comes with heartwarming words to let them know how much they mean to you, today and always. Colorful balloons pop against a sleek black background, setting the scene for a celebration! 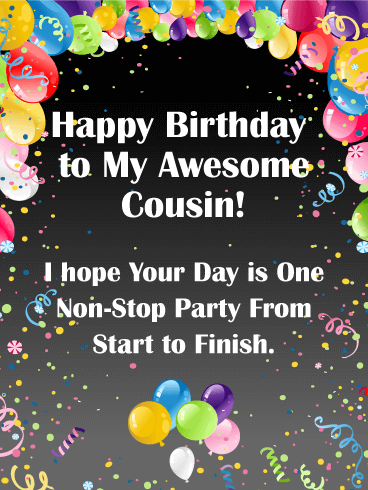 Wish your awesome cousin a happy birthday in style when you send this festive card to let them know you hope their day is "one non-stop party from start to finish!" 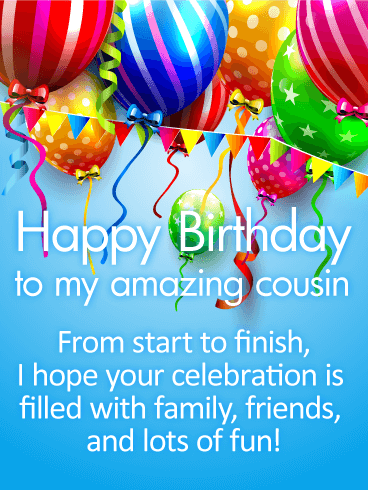 Send your warmest birthday wishes to a wonderful cousin with this beautiful birthday card. A candle-lit cake decorated with glittery gold stars will remind them how much they shine in your eyes, every day and in every way. Balloons and confetti can only mean one thing: it's somebody special's birthday! 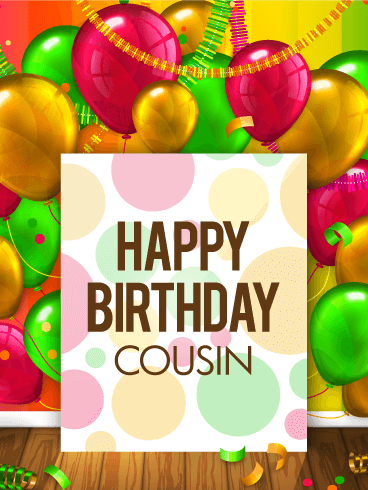 Celebrate a wonderful cousin with this bright, festive birthday card, which will remind them to do all the things that make them most happy. After all, nobody deserves it more! 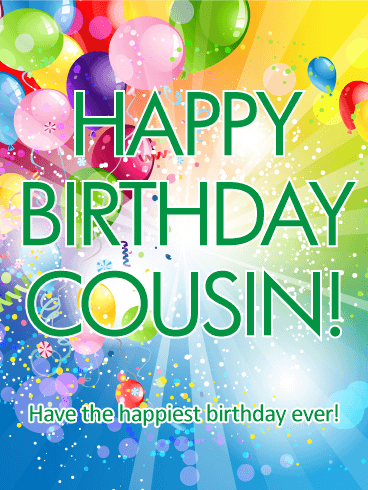 This birthday greeting is very colorful and festive... perfect for celebrating a special cousin in your life "in a big way!" Everything needed for a party is here: balloons, streamers, confetti-and of course, your best wishes, printed brightly and boldly right up front. It's a great choice for anyone, young or old! 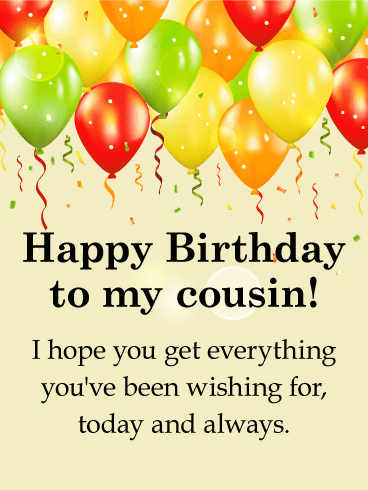 This simple birthday card is a thoughtful way to let your cousin know you're thinking of them and wishing them another year of happiness. 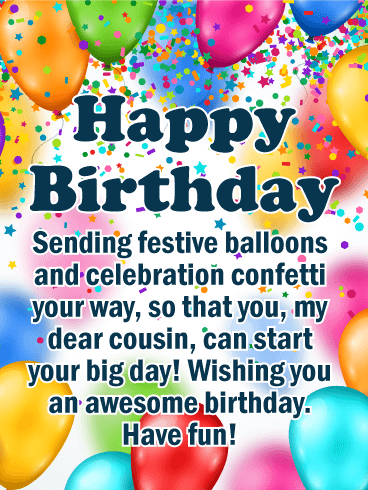 The bright background, filled with balloons and streamers, strikes the right tone for celebrating. 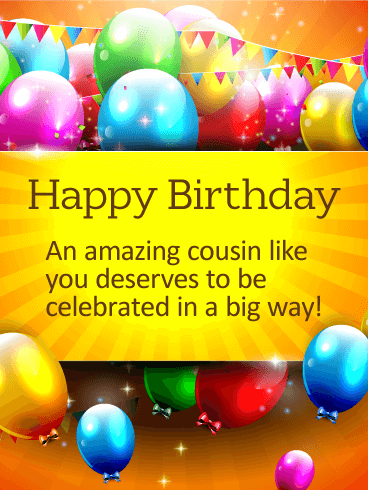 Whether they're young or old, guy or girl, they'll surely appreciate receiving such a fun, festive birthday card! 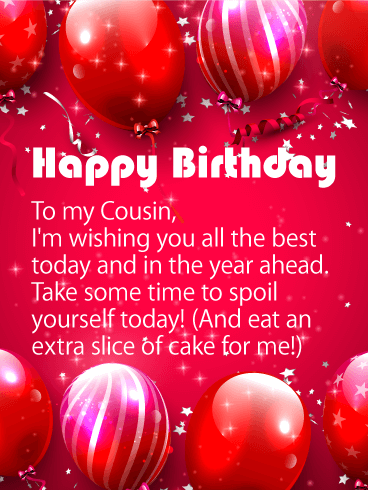 A special cousin's birthday will be the best one yet when you send this birthday card-which is a celebration in itself! A rainbow of color bursts from the background, with balloons, confetti and a wish for them to have "the happiest birthday ever"! What's great about this birthday card is that it's perfect for any age and gender, and most importantly, it will help make the year ahead unforgettable! There's no feeling in the world like when someone you care about reaches out to you on your birthday. It makes you feel loved, appreciated and remembered. 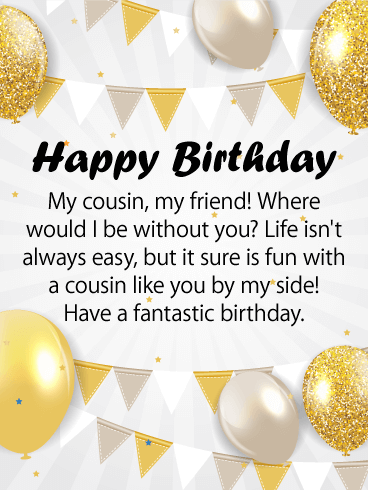 This birthday card gives you the opportunity to let your "amazing cousin" know how special they are, as both a part of your family and as a friend. The light blue background is given a festive touch with balloons, confetti and streamers, adding to the meaning behind your sentiment. 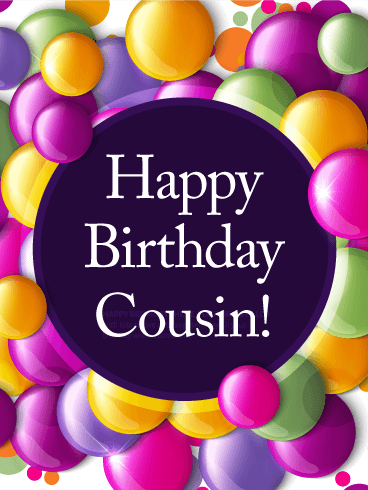 Maybe you're celebrating together this year...or maybe you're sending "Happy birthday" wishes from across the globe. 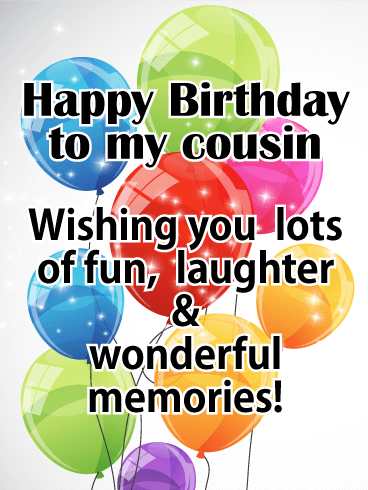 However you choose to recognize your cousin's big day, this is a wonderful birthday card to make them feel remembered. Balloon-like bubbles in rich, warm colors create a festive background, bringing lots of fun and cheer to a very special family member.